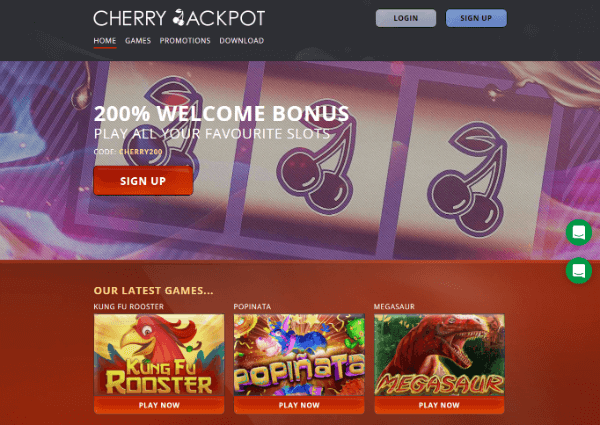 Cherry Jackpot is a brand new online casino , sister to CasinoMAX, coming from the same guys that have been running Club World for ages, so you’re sure to be in good hands. The veterans who operate Cherry Jackpot casino aim to provide players with a casino they can trust, that follows through on what it says, and adheres to the principles and standards of a casino you can jump on board with long term. The thrill of Vegas can be brought to you in the comfort of your living room, with phone, tablet, PC and Mac all supported, where you can play a sweet selection of table games, slots and progressives which is constantly growing every month. Not only this, but the casinos customer service is available 24/7 so your experience is always fun and hassle free. So, what have you been waiting for? Let the fun begin. New players can get off on the right foot by taking advantage of the 200% welcome bonus worth up to $20,000. Yes you read right – a cool $20,000. This is split into your first ten deposits if you use the code CHERRY200. The bonus comes with a wagering requirement of 30x before you can withdraw any money into your account. There is no maximum cash out but if a successful withdrawal has been made from this promotion, then the welcome package will be discontinued. Existing customers will also be able to benefit from daily promotions run by Cherry Jackpot such as Thirsty Thursdays in which you can get 60% deposit bonus and 20 free spins. Other promotions allow you to receive cashback offers and you can always be sure of taking advantage of a special offer no matter what day of the week it is. The normal terms and conditions will apply and it’s probably a good idea to check these on the site before committing any real money. Unfortunately, we could not find any evidence of a VIP or loyalty scheme but hopefully it is something that the casino is considering for the future. Realtime Gaming have been around for nearly 20 years, so it’s obvious they are going to have a huge selection of games, and thankfully there are tons to choose from at Cherry Jackpot. There is no need for any downloads as all games are instant-play and all play wonderfully well and smooth as long as you have a stable internet connection. Additionally, if you want to play the games on any device, simply type the address of the casino into your browser and you’re good to go. Slot fans will be able to choose from five different categories when deciding what game to play, which include 5 Reel, 3 Reel, 6 Reel, Bonus Round and Progressives. There are around 150 in total to play and all the popular RG hits are here such as Aztec’s Treasure, Fruit Frenzy, Cleopatra’s Gold and Cash Bandits. If you fancy your chances of winning big then you can try your luck with progressive titles, including Aztec’s Millions, Megasaur, and Spirit of the Inca. If you feel like a change from spinning the reels, then you can play table games at the casino which include baccarat, blackjack, craps, keno, poker and pontoon. The poker section is really where Cherry Jackpot comes to life in terms of table games, as there are over 50 games of this variety. Unfortunately, there is no live games section at the casino. Even though you can play games at Cherry Jackpot for free, you will only be able to win real money if you deposit funds into your account. Thankfully, you can do this by a variety of methods, including Visa, MasterCard, EcoPayz, Neteller and Skrill. The minimum that you can deposit in one transaction is $35, while the maximum is $1000. All transactions are processed instantly. In terms of withdrawals, the minimum is $35 if you use EcoPayz, Neteller and Skrill, but Visa has a minimum limit of $100. The maximum that you can withdraw is $4000 for most methods, and it usually takes between 3-5 working days to appear in your account. Players will be pleased to know that the latest SSL encryption technology is used to ensure all your personal details and information are kept away from cyber criminals. It is evident that players will be well looked after at Cherry Jackpot due to the sheer experience of the people who operate it. Even though it is a new casino, their expertise shines out with an incredibly slick and modern site that’s very appealing on the eye. There is a great selection of games available that could be benefited by improving the quantity maybe, but this is something that will no doubt improve in the future. Obtaining a license from Curacao is also proof that they are taking steps in the right direction in terms of safety. The welcome bonus has to be one of the biggest we have ever seen, and they also support this by offering regular offers every day of the week, which will no doubt ensure customers happiness and loyalty. Additionally, there is a live chat options available and players will be comforted in the knowledge that they can also speak to a customer support agent through email or telephone. All-in-all, Cherry Jackpot casino is a firm runner in the casino world, which is a great statement of content considering were only established early this year.